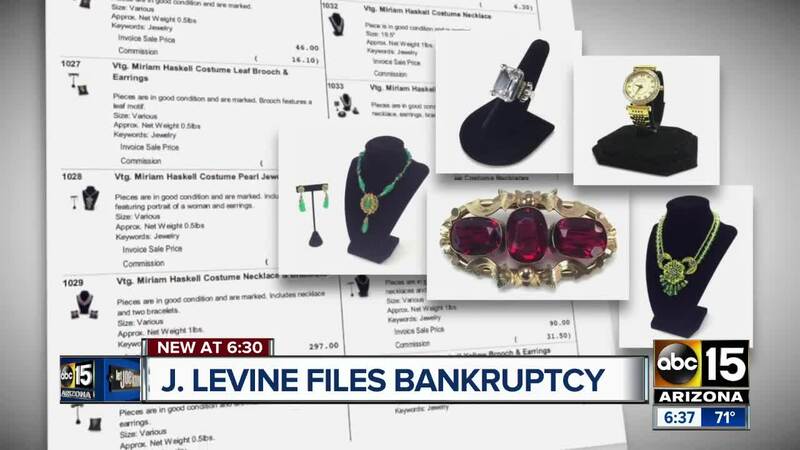 J. Levine files bankruptcy leaving Valley residents sending in complaints to our Let Joe Know team. PHOENIX — Valley based J. Levine Auction and Appraisal filed for Chapter 11 Bankruptcy protection on Friday, according to court filings. Let Joe Know has received several complaints in recent months about payments being much less than agreed upon or none at all. Customer Doug Crandall says he turned over his late wife's jewelry collection to the company in October 2018. Since then he says thousands of dollars in items have been sold, and he hasn't received a dime. The company says it made some "some poor, but well-intentioned, business decisions," in a statement to ABC15, and that it seeks to "reorganize its debts and operations in a way that will facilitate payments to our customers and creditors." "I'm no lawyer," Crandall says. "But I'm not sure if I'm a creditor or if they just stole my money." A spokesman says the business plans to operate during the bankruptcy while they reorganize debts. And plan to ask the judge to approve a system in which J. Levine does not have access to any proceeds from the sale of new customers' items. Customers who want to pick up their items that have not been sold can call 602-258-1752 to set up an appointment.